Less is more? Pah! More is more when it comes to barrel aged beers at Hawkers. 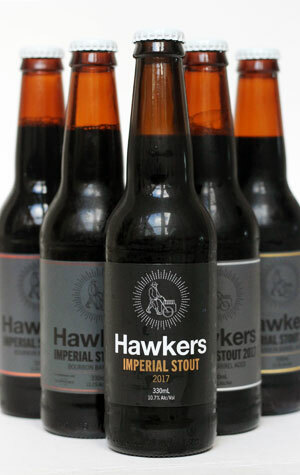 Having launched its barrel program in 2016 with bottle releases of a bourbon barrel aged imperial stout and a barley wine, for winter 2017 they've taken this year's vintage of Imperial Stout – a beer that's already bigger in ABV and boozy character than last year's impressive debut – popped it inside two different types of spirit barrel and then split the bourbon barrel element into three, resulting in four beers to be released simultaneously in subtly different packaging. The straight Bourbon Barrel version has nudged the 10.7 percent ABV base beer up to 11.6 and is, in the opinion of the tasting panel of two at Crafty Towers, the pick of all five 2017 beers. It's taken on a silken quality in the glass and adds soft oaky, vanilla characters and a dry, tannic finish to the sweet chocolate underpinning everything. The bourbon aged Fig and Maple version features BBQ smoked figs from "the Shouman family garden" that were added in the barrels and after a second fermentation before the beer was blended with maple. It's the maple that contributes most, transforming it into something akin to a Pedro Ximenez sherry – huge, rich, sweet, lightly smoky fortified characters smother your olfactory system. It will be a familiar experience for the sweet toothed out there who've enjoyed Stockade's Mountie, one in which the bourbon character pokes its nose through late on. The third of the bourbon variants is brewed with Nicaraguan Las Delicias Coffee from Coffee Supreme, which present as if layered atop the beer and deliver a genuine roasted bean, rather than espresso or sweeter extract, character. The fourth in the lineup is, we're told, the first Aussie beer to be aged in Aquavit barrels. Hawkers secured them from Norway's Linie, which sends its spirit across the equator and back a couple of times before release. The beer has risen most in alcohol content, reaching 12.4 percent ABV, suggesting it's soaked up plenty of residual Aquavit. You can tell from the off, with a spiritous quality on the aroma that carries through to the taste, albeit less noticeably, and a lighter palate weight than its compatriots too. Launched at an event in Adelaide on July 26 then available nationwide from July 31.